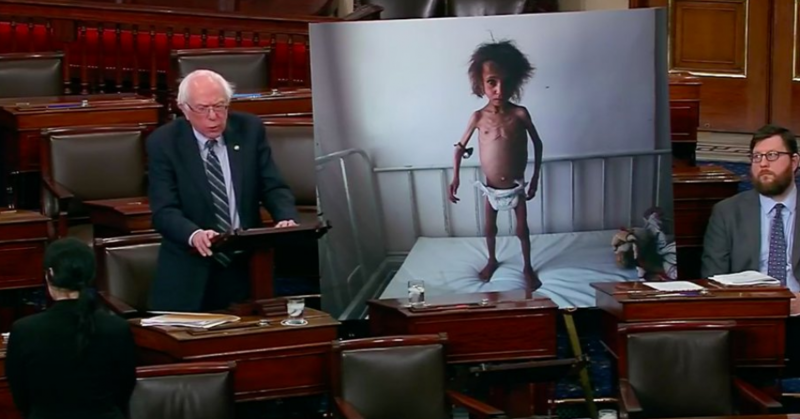 While a vote in the U.S. Senate to push forward a War Powers Resolution on Wednesday resulted in applause from peace advocates and critics of the U.S. involvement in the Saudi-led assault on Yemen, five Democrats in the U.S. House stirred outrage as they helped Republicans in the chamber pass a rule—attached to massive Farm Bill legislation—that effectively killed the hopes of voting on its version of the resolution for the remainder of the congressional session. But in the House, say critics, the five Democrats—Reps. Jim Costa (Calif.), Al Lawson (Fla.), Collin Peterson (Minn.), Dutch Rupperberger (Md. ), and David Scott (Ga.)—sent the exact opposite message by backing the GOP-led effort to kill the resolution. MSNBC‘s Chris Hayes was just one of the journalists and other experts following the story who expressed outrage about the House vote. What a despicable sham. What the hell is the point of Congress? Why are we starving children? Someone make some affirmative argument for the policy, if you think it’s so important to continue killing children. But to kill the possibility of a vote in the rules committee? Cowards. Kind of amazing that Democrats bailed Republicans out on this one. This was a clear winning issue for Democrats. Does the voting public support Republicans sliding in language to a farm bill rule to subvert the War Powers Act and block any debate on Yemen? This entry was posted in Corruption, Economics, Government, Human Rights, International Agreements, Military, Religion, Social Justice, War, War Crimes and tagged Al Lawson, Bernie Sanders, Chris Hayes, Collin Peterson, Corruption, David Scott, Dutch Rupperberger, Economics, Farm Bill, Human rights, International Agreements, Jim Costa, Military, religion, social justice, US military aid, War, War Crimes, War Powers Resolution on December 13, 2018 by ew.